The day of our station lunch for Memorial Day Weekend, I shamelessly stuffed my face with a plate full of food. Then I went back for seconds. I'm telling you - we have some really good cooks at Citadel Broadcasting! 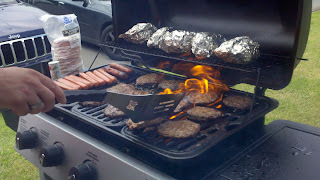 B98's Kevin Miller grilled the hot dogs, burgers, and Dianne's foiled onions - I ate a little of all these things. All delicious!! I even took some of Dianne's onions home with me! 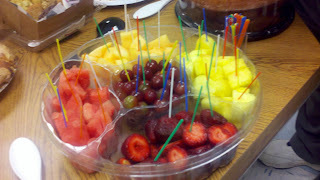 KARN News Radio's Jack Heinritz made the fruit a little more festive with what looks like multi - colored drink stirrers? Well, it was a great team effort at our little diverse group of radio stations for some food and fellowship. Our company potlucks are fun! I was a little nervous to make these. (I thought they sounded good for the occasion.) 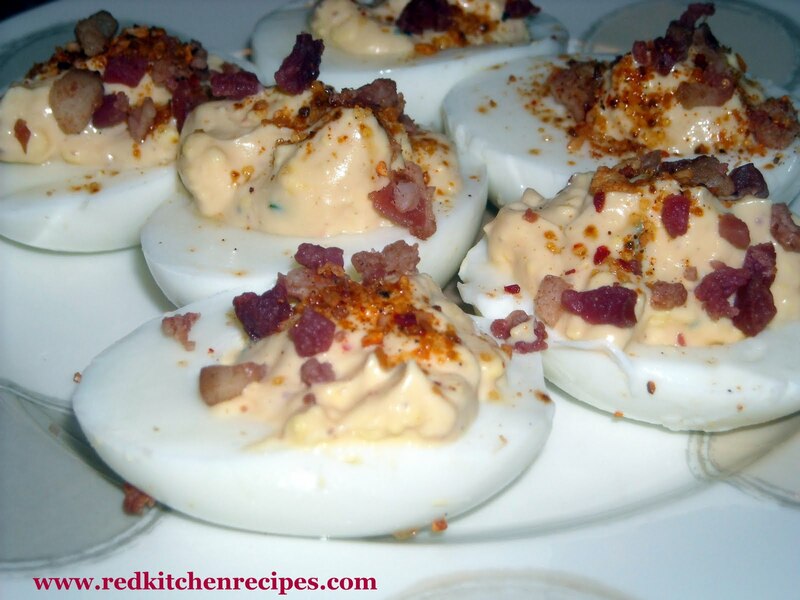 But it's been years since I've made deviled eggs, and over the years I have had some quite bland ones from the grocery stores. So I researched several different blogs and web sites to see what ingredients they used, then in the end it was the Smokehouse Maple seasoning that I used that gave the eggs the flavor that I had in mind. Put the eggs into a large pot, then fill with water to just above eggs. Over medium - high heat, bring the water up to a boil. When you see the big bubbles, cover the pot and remove it from the heat. Let sit for 10 minutes, then empty the water from the pot and run cold water over the eggs. Peel the eggs then slice in half lengthwise. Scoop the yolks into a bowl and add the last 5 ingredients. Mash with a fork and mix well. Put the filling into a large Ziploc bag, then cut the bottom corner and pipe the filling onto the egg halves. Top with real bacon bits, and appreciate those who have served the country for Memorial Day.